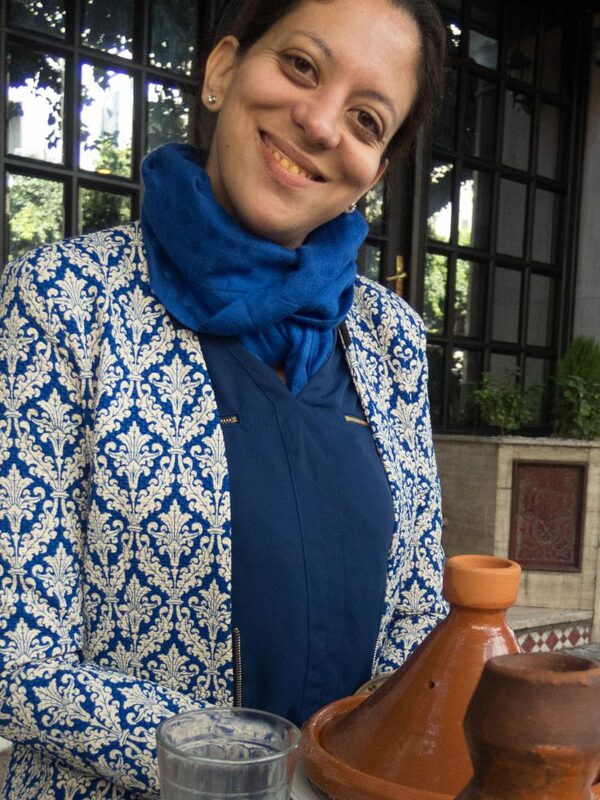 Mentoring is a two way street, and one must eat, so Jihane introduced Nina to some local culinary delights. When his daughter – the next MD, so he hoped – came up with a suggestion whereby a facilitator would “leave the watch on their wrist” and help them read it, he decided to give it a try. With support from me and my colleagues, the management team assessed their company and crafted specific action plans to address key problem areas. They left the workshop excited and energized. I’ve spent 20 years working with entrepreneurs, managers, and assorted individuals – young and old, simple farmers, workers, students, housewives, managers, CEOs with MBAs, medical doctors. Most of this work has been in southern Africa. Much of it, especially when counting work done by facilitators I’ve trained, has been in Madagascar. Though the above scenario is not unique to Madagascar, or Africa for that matter, it is common. Yes, some companies do very well following such an intervention. For years, though, I struggled to understand how two companies could go through the same type of workshop and progress so differently when it came to implementation. Some worked through their action plans with great focus, determination, and ultimately success, while others just went back to “business as usual”, perhaps after a couple of weeks of half-hearted attempts. Why? There didn’t seem to be a close correlation with talent, education or intelligence. Concepts such as “learning organisation” and “company culture” had something to do with it, but didn’t really cut to the core. Then I read “Mindset: The New Psychology of Success”, published in 2006 by Stanford University psychologist Carol S. Dweck. In her book, Prof. Dweck outlines her findings from decades of research into why specific people succeed and others don’t, and how to promote or foster success. Prof. Dweck discovered that the degree to which people and organisations achieve their potential correlates with their mindset. She describes two basic types of mindset: fixed and growth. Whereas people with a growth mindset embrace challenges, and see failure as an opportunity to learn, people with a fixed mindset are risk averse. For them, failure is very traumatic; it tarnishes their carefully preserved self-image. In fact, research shows that people with a fixed mindset neither admit, nor correct their deficiencies. Instead, they often lie to cover them up. In business, the fixed mindset desire to be seen as perfect is so widespread that it has a name: the “CEO disease”. But it is not limited to CEOs. Unsurprisingly, companies with a growth mindset culture weather challenges best. Prof. Dweck sites research by Jim Collins from his book “Good to Great” in which sustainably successful companies were compared to their competition. The most outstanding difference was their leadership. The highly successful companies had self-effacing leaders who asked lots of questions and were able to confront the sometimes brutal truth of failure – even their own – head on, while not losing confidence in their longer term success. In other words, these leaders had growth mindsets. They were focused on learning and improving, not on being right. 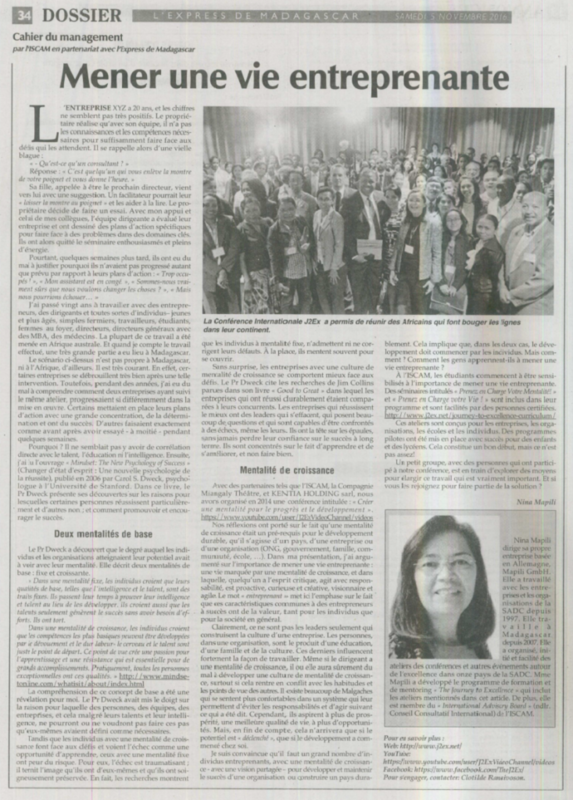 My company, together with partners ISCAM, Company Miangaly Théâtre and KENTIA HOLDING sarl, organised a conference in 2014 entitled “Creating a Mindset for Growth and Development”. 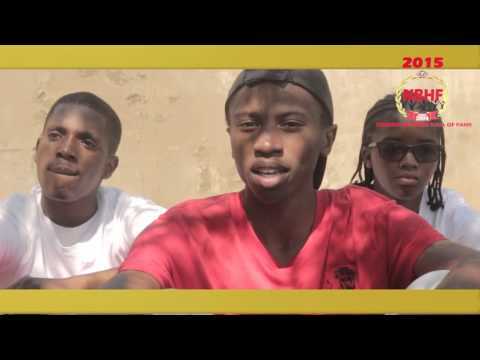 https://www.youtube.com/user/J2ExVideoChannel/videos Our premise was that a growth mindset, through its support for the achievement of personal and organisational potential, is a prerequisite for sustainable development – be it in a country, company or other organisation (NGO, government, family, community, school…). In my opening presentation, I argued the value of leading an “enterprising life” – a life hallmarked by a growth mindset, and in which one thinks critically, acts responsibly, is pro-active, curious and creative, visionary, agile. 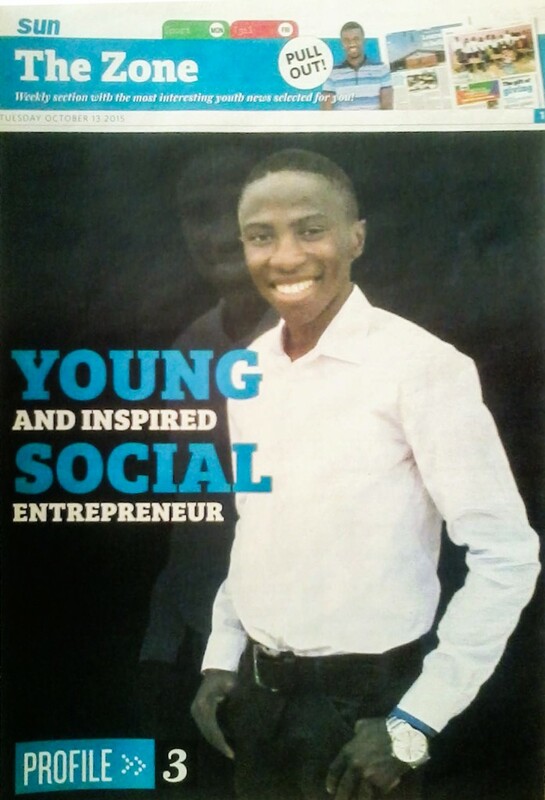 The word “enterprising” is used not to say that everyone must become an entrepreneur and start a business, but rather to emphasize that those characteristics common to successful entrepreneurs are valuable to people and society in general. Why is this important from an organisational standpoint? One of the exercises my colleagues and I like to do with businesses or other organisations is “The way it is vs. The way it should be”. In the first part of the exercise, teams of 5 or 6 people use their bodies and sounds to illustrate what their organisation would be like if it were a machine. In the second part, they illustrate the way the machine should be working. Instead of creating, for example, a machine that has many different parts, each doing its thing with varying degrees of coordination and noise relative to other parts, we have observed a different solution common in Madagascar. Here, teams choose to be some type of vehicle – plane, bus, train. In version one, the ride is bumpy. In version two – the way it should be – the ride is smooth. Common to both is that one person is up front steering, and the rest sit back passively, just along for the ride. This “one genius and a lot of hands” approach is a reflection of a fixed mindset. Imagine the increased potential if those passive hands were instead responsible, proactive, creative, agile people working toward a shared vision! Clearly, though, it is not only the leader who shapes company culture. The people in an organisation are the product of their education, family, and culture. All of these strongly influence the way they do their work. Even if a leader has a growth mindset, s/he will be mightily challenged when trying to develop a growth mindset culture if it conflicts with people’s longstanding habits and views of themselves in the world. Many Malagasy people seem most comfortable in a system that allows them to avoid responsibility and passively do as they’re told. At the same time, they wish for more prosperity, a better quality of life, more opportunities for themselves and their children, and at least some of those aspirational things they see on billboards, in magazines or on TV. Ultimately, this isn’t going to happen unless their potential is “unleashed”, unless development is home-grown. I’m convinced that it takes a critical mass of enterprising, growth mindset individuals – with a shared vision – to develop and maintain a successful organisation – or a sustainable country. The implication is that in both cases development must start with the individual. But how? How do people learn to lead an enterprising life? At ISCAM, students are introduced to the importance of leading an enterprising life through my “Take Charge of Your Mindset!” and “Take Charge of Your Life!” programs, which have been incorporated into their curriculum. 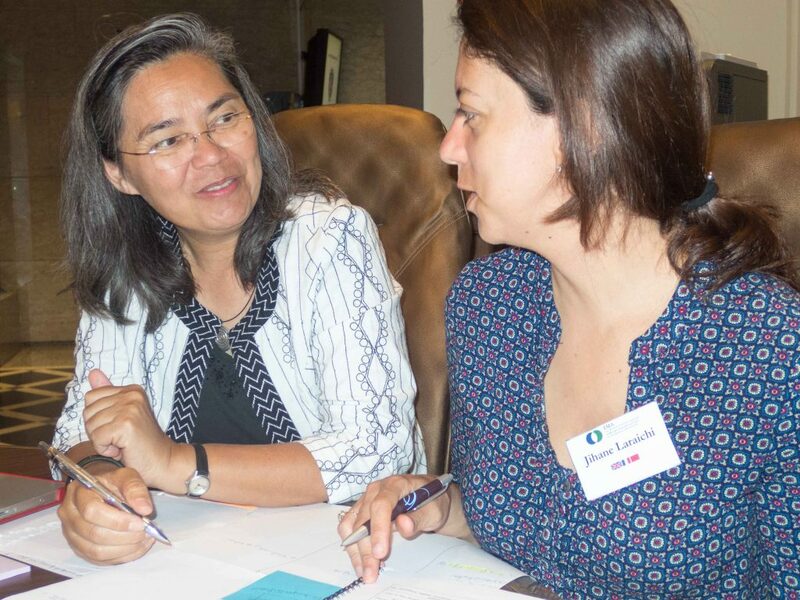 http://www.j2ex.net/journey-to-excellence-curriculum/ Licensed facilitators offer workshops tailored for businesses, organisations, schools and individuals. Very successful pilot programs have been carried out with pre-schoolers and high school students. That is all very good, but it isn’t enough! A small group, with people from the conference partners at its core, is exploring ways to expand the reach of this important work. Why don’t you join them, and become part of the solution? Sa fille, appelée à être le prochain directeur, vient vers lui avec une suggestion. Un facilitateur pourrait leur « laisser la montre au poignet » et les aider à la lire. Le propriétaire décide de faire un essai. Avec mon appui et celui de mes collègues, l’équipe dirigeante a évalué leur entreprise et ont dessiné des plans d’action spécifiques pour faire face à des problèmes dans des domaines clés. Ils ont alors quitté le séminaire enthousiasmés et pleins d’énergie. 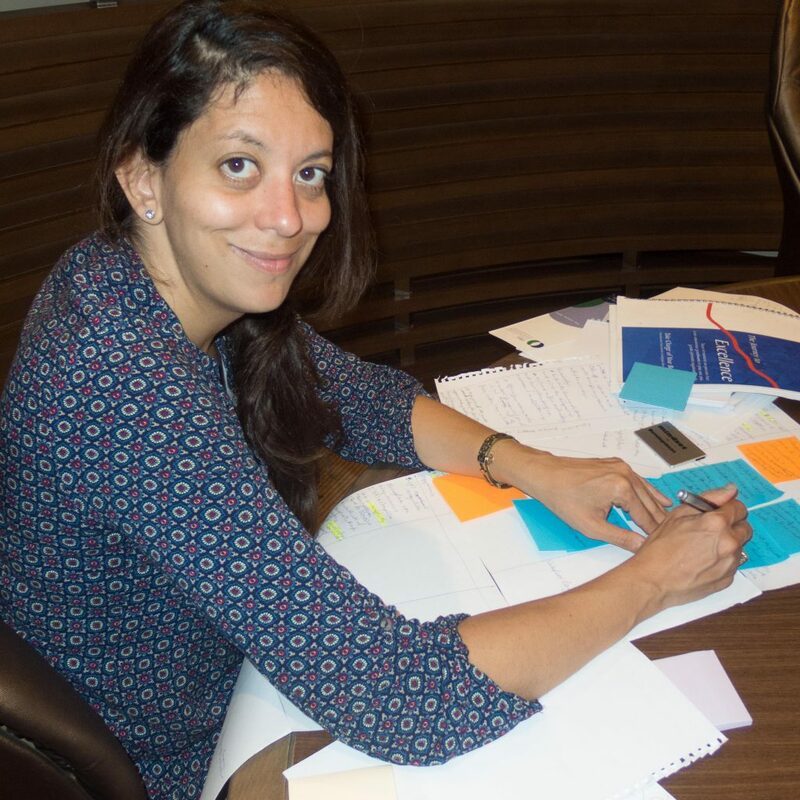 J’ai passé 20 ans à travailler avec des entrepreneurs, des dirigeants et toutes sortes d’individus – jeunes et plus âgés, simples fermiers, travailleurs, étudiants, femmes au foyer, directeurs, directeurs généraux avec des MBA, des médecins. La plupart de ce travail a été menée en Afrique australe. Et quand je compte le travail effectué, une très grande partie a eu lieu à Madagascar. Le scénario ci-dessus n’est pas propre à Madagascar, ni à l’Afrique d’ailleurs. Il est très courant. En effet, certaines entreprises se débrouillent très bien après une telle intervention. Toutefois, pendant des années, j’ai eu du mal à comprendre comment deux entreprises ayant suivi le même atelier, progressaient si différemment dans la mise en œuvre. Certains mettaient en place leurs plans d’action avec une grande concentration, de la détermination et ont du succès. D’autres faisaient exactement comme avant après avoir essayé – à moitié – pendant quelques semaines. Pourquoi? Il ne semblait pas y avoir de corrélation directe avec le talent, l’éducation ni l’intelligence. Ensuite, j’ai lu l’ouvrage “Mindset: The New Psychology of Success” (Changer d’état d’esprit : Une nouvelle psychologie de la réussite), publié en 2006 par Carol S. Dweck, psychologue à l’Université de Stanford. Dans ce livre, le Professeur Dweck présente ses découvertes sur les raisons pour lesquelles certaines personnes réussissent particulièrement et d’autres non ; et comment promouvoir et encourager le succès. Le Professeur Dweck a découvert que le degré auquel les individus et les organisations atteignaient leur potentiel avait à voir avec leur mentalité. Elle décrit deux mentalités de base : fixe et croissante. “Dans une mentalité fixe, les individus croient que leurs qualités de base, telles que l’intelligence et le talent, sont des traits fixes. Ils passent leurs temps à prouver leur intelligence et talent au lieu de les développer. Ils croient aussi que les talents seulement génèrentle succès sans avoir besoin d’efforts. Ils ont tort. Dans une mentalité de croissance, les individus croient que les compétences les plus basiques peuvent être développées par le dévouement et le dur labeur- le cerveau et le talent sont juste le point de départ. Ce point de vue crée une passion pour l’apprentissage et une résistance qui est essentielle pour de grands accomplissements. Pratiquement, toutes les personnes exceptionnelles ont ces qualités. La compréhension de ce concept de base a été une révélation pour moi. Le Professeur Dweck avait mis le doigt sur la raison pour laquelle des personnes, des équipes, des entreprises, et cela malgré leurs talents et leur intelligence, ne pourront ou ne voudront pas faire ces pas qu’eux-mêmes avaient défini comme nécessaires. Tandis que les individus avec une mentalité de croissance font face aux défis et voient l’échec comme une opportunité d’apprendre, ceux avec une mentalité fixe ont peur du risque. Pour eux, l’échec est traumatisant ; il ternit l’image qu’ils ont d’eux-mêmes et qu’ils ont soigneusement préservée. En fait, les recherches montrent que les individus à mentalité fixe, n’admettent ni ne corrigent leurs défauts. A la place, ils mentent souvent pour se couvrir. Sans surprise, les entreprises avec une culture de mentalité de croissance se comportent mieux face aux défis. Le professeur Dweck cite les recherches de Jim Collins parues dans son livre « Good to Great » dans lequel les entreprises qui ont réussi durablement étaient comparées à leurs concurrents. Les entreprises qui réussissent le mieux ont des leaders qui s’effacent, qui posent beaucoup de questions et qui sont capables d’être confrontés à des échecs, même les leurs. Ils ont la tête sur les épaules, sans jamais perdre leur confiance sur le succès à long terme. Ils sont concentrés sur le fait d’apprendre et de s’améliorer, et non faire bien. Avec des partenaires tels que l’ISCAM, la Compagnie Miangaly Théâtre et KENTIA HOLDING sarl, nous avons organisé en 2014 une conférence intitulée : « Créer une mentalité pour le progrès et le développement. »https://www.youtube.com/user/J2ExVideoChannel/videos Nos réflexions ont porté sur le fait qu’une mentalité de croissance était un prérequis pour le développement durable, qu’il s’agisse d’un pays, d’une entreprise ou d’une organisation (ONG, gouvernement, famille, communauté, école, …). Dans ma présentation, j’ai argumentésur l’importance de mener une vie entreprenante : une vie marquée par une mentalité de croissance, et dans laquelle, quelqu’un a l’esprit critique, agit avec responsabilité, est proactive, curieuse et créative, visionnaire et agile. Le mot « entreprenant » ici met l’emphase sur le fait que ces caractéristiques communes à des entrepreneurs à succès ont de la valeur tant pour les individus que pour la société en général. Clairement, ce ne sont pas les leaders seulement qui construisent la culture d’une entreprise. Les personnes dans une organisation sont le produit d’une éducation, d’une famille et de la culture. Ces derniers influencent fortement la façon de travailler. Même si le dirigeant a une mentalité de croissance, il ou elle aura sûrement du mal à développer une culture de mentalité de croissance surtout si cela rentre en conflit avec les habitudes et les points de vue des autres. Il existe beaucoup de Malgaches qui se sentent plus confortables dans un système qui leur permettent d’éviter les responsabilités et d’agir suivant ce qui a été dit. Cependant, ils aspirent à plus de prospérité, une meilleure qualité de vie, à plus d’opportunités. Mais, en fin de compte, cela n’arrivera que si le potentiel est “déclenché”, que si le développement a commencé chez soi. Je suis convaincue qu’il faut un grand nombre d’individus entreprenants, avec une mentalité de croissance- avec une vision partagée- pour développer et maintenir le succès d’une organisation ou construire un pays durablement. Cela implique que dans les deux cas, le développement doit commencer par les individus. Mais comment ? Comment les gens apprennent-ils à mener une vie entreprenante ? A l’ISCAM, les étudiants commencent à être sensibilisés à l’importance de mener une vie entreprenante. Des séminaires intitulés “ Prenez en Charge Votre Mentalité!” et “Prenez en Charge votre Vie ! sont inclus dans leur programme et sont facilités par des personnes certifiées. 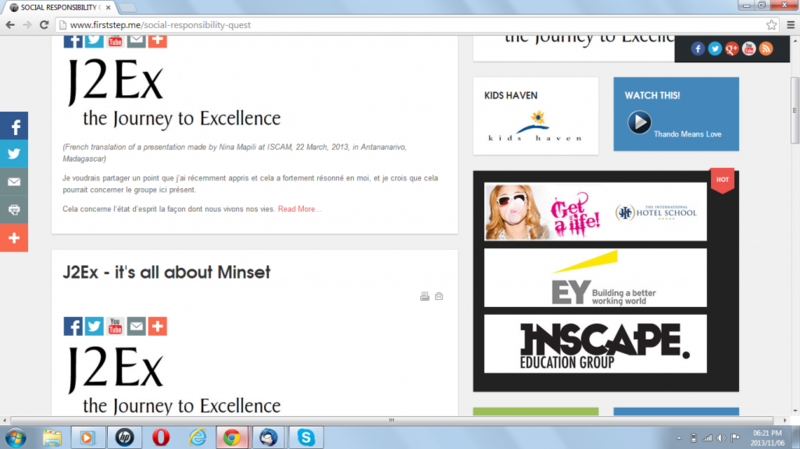 http://www.j2ex.net/journey-to-excellence-curriculum/ Ces ateliers sont conçus pour les entreprises, les organisations, les écoles et les individus. Des programmes pilotes ont été mis en place avec succès pour des enfants et des lycéens. Cela constitue un bon début, mais ce n’est pas assez! Un petit groupe, avec des personnes qui ont participé à notre conférence, est en train d’explorer des moyens pour élargir ce travail qui est vraiment important. Et si vous les rejoignez pour faire partie de la solution? We’re thrilled because he credits J2Ex , next to JA, as one of the programs that gave him the skills he needed to excel. Par où commencer, quand se décider, et si… et si… d’hésitations en questionnements nous finissons par abandonner. Le poids des problèmes, la honte des « on-dit », la peur de l’échec… , tout nous est blocage, tout nous arrête. Et pourtant d’autres ont réussi en ayant mis de côté « ce qu’en pensait les autres ». L’échec, une école pour la réussite ? Nos ancêtres n’ont-ils pas dit : « Tombez, chutez, vous saurez mieux marcher » ? D’ailleurs, des héros d’hier et d’aujourd’hui ont trébuché des centaines, voire des milliers de fois. Mais ils ne se sont pas laissés abattre, ils se sont relevés, poursuivant leur rêve, vivant leur passion. Quelques exemples suffiront à convaincre. Walt Disney: il a commencé par être renvoyé d’un poste de rédacteur sous prétexte de manquer d’imagination. Il a connu des faillites et d’autres échecs dans des lancements d’entreprises. Qui ne connait pas Walt Disney ? Thomas Edison : par deux fois il fut congédié pour sa « stupidité » et son incapacité à apprendre quoi que ce soit. Faut-il rappeler qu’il est l’inventeur de l’ampoule électrique contemporaine. Il lui a fallu 1 000 tentatives infructueuses avant d’arriver au résultat que nous connaissons actuellement. Elvis Presley : en 1954, lors d’une première audition on lui aurait dit « qu’il n’aura jamais d’avenir dans la musique et qu’il ferait mieux de conduire un camion ». Et pourtant, son nom a traversé des générations et ses disques se vendent toujours à merveille jusqu’à nos jours. Cette passion qui fait partir de rien, pour réussir sans presque aucun soutien. Cette passion qui fait vivre un projet et qui arrive même à faire fructifier ce qu’on croyait être un frein. Tout mène à réussir, tant qu’on y met du sien. Il ne faut pas attendre les autres, ni leur reprocher nos chutes. Quels que soient nos rêves, quelle que soit notre vision, il faut d’abord agir et seulement après, poser les questions. En fait, tout est « entreprise ». Il n’y a pas que les affaires. Notre vie de tous les jours, notre famille, notre communauté. L’entreprise est l’audace, l’énergie et l’invention. Tout est à entreprendre. Et pour ce faire, il nous faut vivre une vie entreprenante. Mais également une vie proactive, créative, visionnaire et agile. Donc il faut déjà avoir un état d’esprit, des outils et puis une vision, et ainsi, la formuler pour ne plus s’arrêter jusqu’à sa réalisation. Il n’y aura pas que les proches ni les amis fidèles qui accompagneront, dans cette belle aventure. Car plus on le fait simple et plus on est bref, des partenaires viendront d’eux-mêmes, pour soutenir et poursuivre ensemble le chemin. De tout ce qui a été dit, je n’ai rien inventé. C’est une façon de voir, c’est aussi une manière pour avancer. Entretemps, le mieux c’est de décortiquer et d’arrêter de critiquer. De se donner comme mot d’ordre «performer » et non « réformer». Comme cela nos regards vont quitter le passé, pour pouvoir axer tous les efforts vers le futur. Les forces, les faiblesses: serviront à se regarder en face, quant aux opportunités et aux menaces: elles seront saisies pour mieux s’adapter. En tout cas tout est question de valeur. Il s’agit de définir à la fois ce qui nous tient à cœur et ce sur quoi nous misons. Ce sont ces valeurs qui vont créer de l’argent, et non le contraire car ce serait illusion. Laissons-nous tenter par ce parcours unique qu’est la volonté de vouloir changer. Ce, pour se forger, grandir et créer une nouvelle mentalité. Le progrès et le développement seront ainsi à notre portée. Et si entre les lignes, vous apercevez des rimes; ou entre les mots vous me sentez divaguer ; c’est que de ce voyage que je viens d’entamer, des slameurs – des artistes et aussi des acteurs, m’ont quelque peu enchantée ! 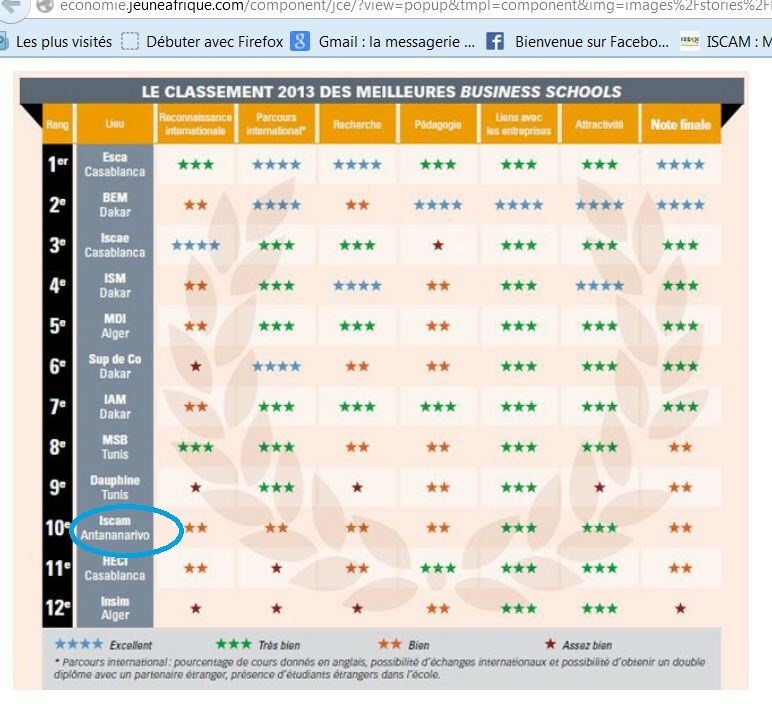 * Traduction de « The Journey to excellence ou J2Ex», un programme qui accompagne des individus, des groupes ou des entreprises dans leur quête de transformer leur rêve en réalité. J2ex a organisé une conférence internationale à Antananarivo les 19, 20 et 22 septembre 2014. Conférence conjointement organisée par Safri, MapiliGmbH, compagnie Miangaly, l’Iscam, et Kentia Holding. Yashivan Govender, founder of FirstStep.me, was interviewed recently by South Africa’s Sunday Times on the topic of what it takes to make a great conference. We were pleased to see that he mentioned the recent J2Ex Conference “Creating a Mindset for Growth and Development” as a benchmark! Sunday Times, 23 Nov. 2014. 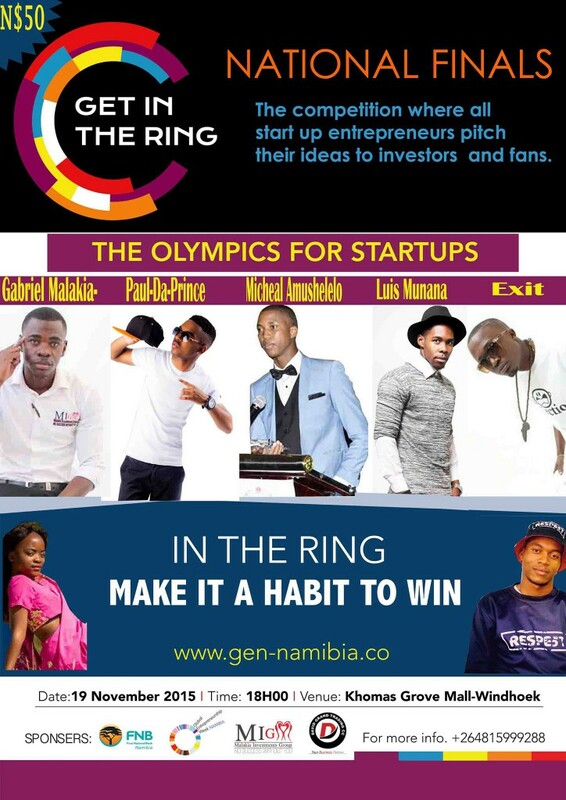 Find on page 17 of the BusinessTimes section. CONFERENCES can lack direction, with the after-hours events being more memorable than the formal programme. 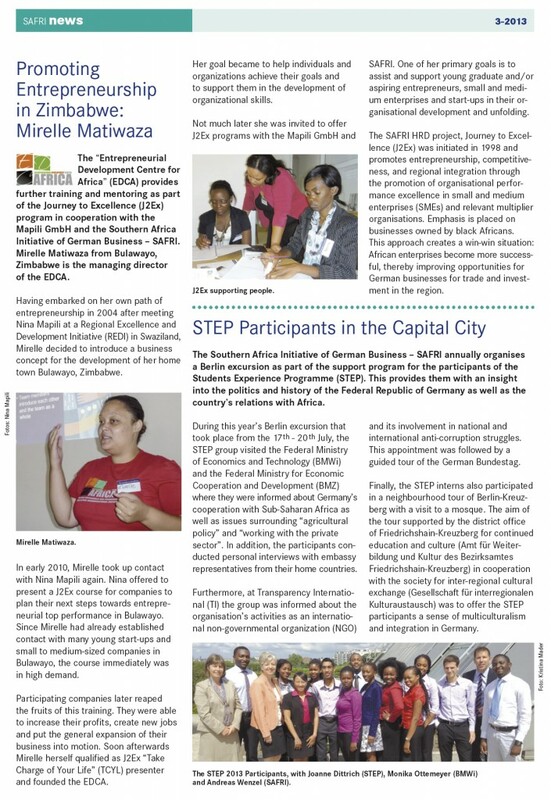 However, a recent conference run by the Journey to Excellence programme with the Southern Africa Initiative of German Business, held in Antananarivo,Madagascar, provided an example of a conference that worked, said Yashivan Govender, founder of FirstStep.me. Make it more than a talk shop. Over five days after the Madagascarconference, a select group stayed on to implement projects that were developed during the workshops. “It was a great example of a group of international experts being willing and able to create an impact in a region desperate for foreign attention,” said Govender. Mit Fragen der Entwicklung des südlichen Afrika und der Rolle des Privatsektors beschäftigten sich 22 Stipendiaten auf Einladung von Boehringer Ingelheim in Mainz. Gegenstand der Gruppenarbeit war das Afrika-Bild (Klischee versus Daten und persönliche Einschätzungen) sowie Ansätze für Social Entrepreneurship als wichtigem Bestandteil der Entwicklungshilfe. Im Dialog wurde das Afrika-Bild aufgefächert und Klischees Daten und persönlichen Einschätzungen gegenübergestellt. In Kleingruppen befassten sich die Teilnehmer darüber hinaus exemplarisch mit Ansätzen für Social Entrepreneurship als wichtigem Bestandteil der Entwicklungshilfe. Weitere Fotos finden sich auch auf unserer Facebook-Seite. Big Things Clothing is going places! 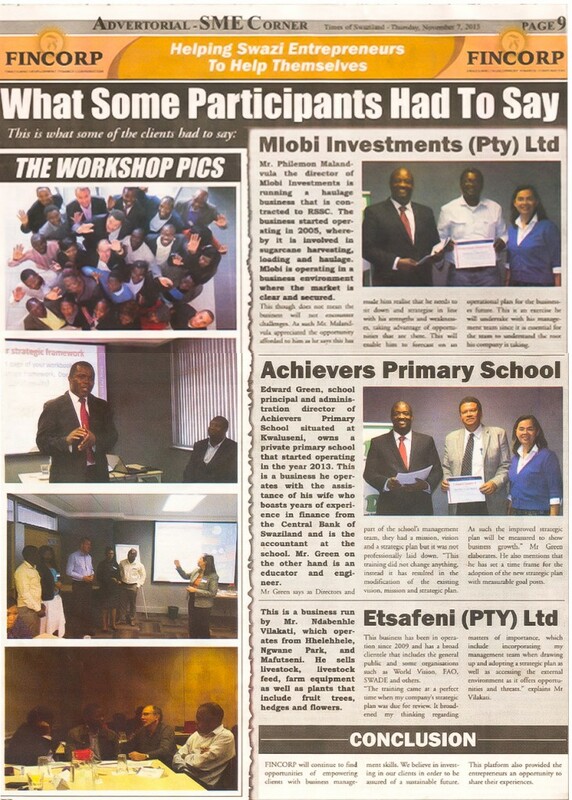 In August, 2013, REDI, a Swazi consulting company and long-time J2Ex partner held a “Take Charge of Your Business!” workshop for clients of Fincorp, a Swazi Development Finance Institution. The workshop was facilitated by REDI founder and MD Dr. Sikhomba Gumbi, with J2Ex Program Developer Nina Mapili and Lungi Mareka, a J2Ex facilitator from Namibia assisting. Special guests from Germany, both internationally experienced trainers, were also in attendance to learn more about the J2Ex Program: Klaus Schuler and Martin Holzmann. 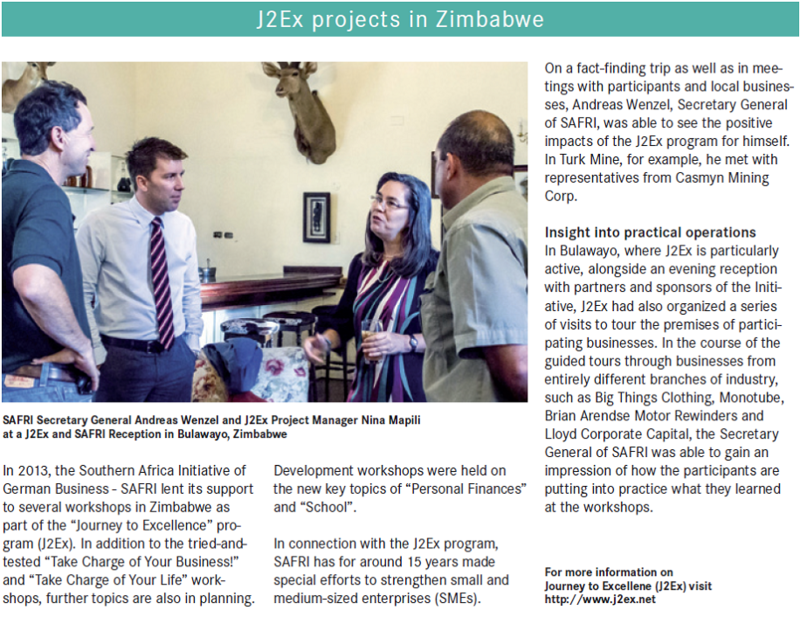 In February of 2013, SAFRI Secretary General Andreas Wenzel came to Bulawayo, Zimbabwe to meet local businesspeople, J2Ex partners, and J2Ex workshop participants. FirstStep.me is a website dedicated to helping young people get a good start in an interesting life. We’re glad to see them promoting J2Ex! 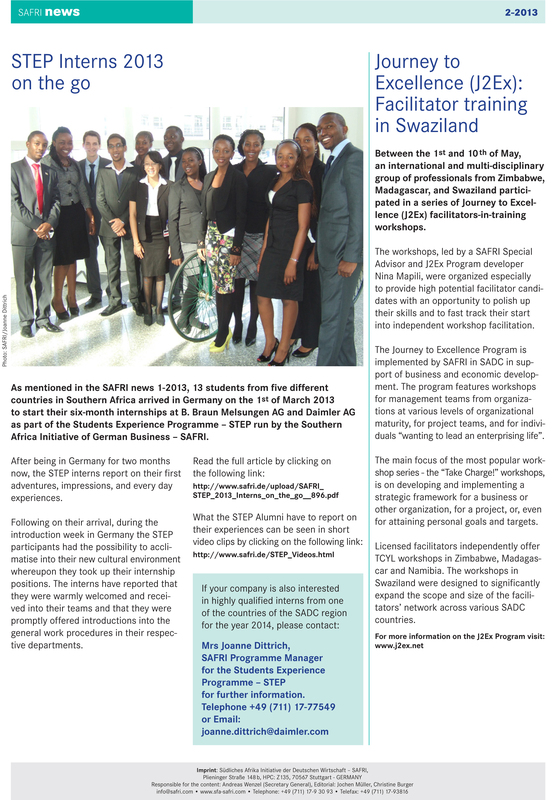 TCYL Facilitator Mirelle Matiwaza was featured in the August 2013 edition of SAFRI News. Mirelle Matiwaza is a Journey to Excellence program “Take Charge of Your Life!” workshop facilitator who focuses on working with young people and with communities in rural areas of Zimbabwe. Connectivity problems have kept us from uploading workshop photos from May-June 2013, but fortunately the feedback compilation came through. Lead Facilitator Mirelle Matiwaza of EDCA and her assistants – Thulani Matiwaza, Khayalihle Moyo, Lennox Masukume – did a great job, according to the secondary school learners who participated! Local Partner: The workshop was held in cooperation with Lead Us Today, an NGO in Bulawayo that works with secondary school learners. See: http://www.leadustoday.org/. 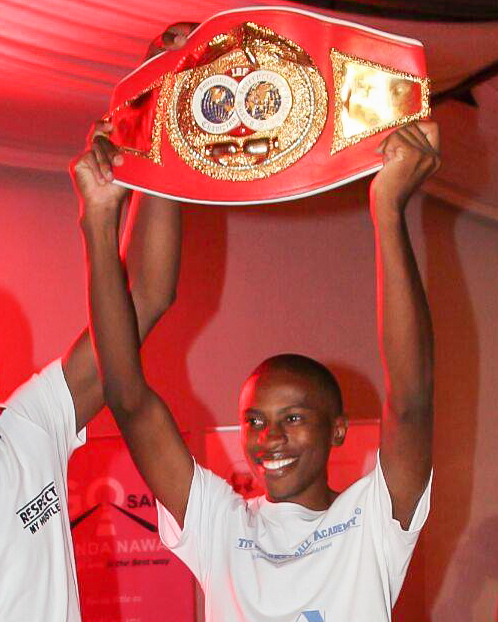 Sponsors: SAFRI, the Southern Africa Initiative of German Business (www.safri.de), and a Rotary Club from Germany. La recherche du Prof. Dweck indique qu’il y a 2 types d’Etat d’Esprit : l’état d’esprit fixe et en croissance. Ce n’est pas tout le monde qui peut devenir un Einstein, mais avec les années de « passion, labeur et d’entrainement » beaucoup, beaucoup de choses sont possibles ! Qu’en est – il de vous ? Évitez-vous des situations qui peuvent compromettre votre image à un risque ? En d’autres termes, là où vous pouvez perdre ? Ce sont tous des caractéristiques de l’état d’esprit fixé. Sinon, considérez-vous la vie comme un voyage, avec des défis excitants – et des opportunités pour apprendre et améliorer ? Faites vous des tâches représentants le challenge – des objectifs élevés – pour vous-même ? Est-ce que cela vous demande le maximum de votre capacité que vous ne pourriez pas réaliser, malgré votre meilleur effort ? Ce qui est intéressant, la recherche montre que les personnes ayant cet état d’esprit toujours en croissance, sont plus exactement conscientes de leurs propres forces et faiblesses que ceux avec des états d’esprits fixes. Que je me fasse bien comprendre ; certain peuvent aller loin avec un état d’esprit fixe. Il y a même une « maladie » associée avec cela : « la maladie DG ». Beaucoup d’entre vous sont, ou aspirent à devenir un Directeur Général. Que pensez-vous être les symptômes de cette maladie ? La maladie de ces gens consiste surtout à leur besoin d’être vu en tant que personne qui sait tout et qui est parfait (plus intelligents que les autres). Ils veulent être idolâtrés ; ils ne tolèrent pas les gens qui connaissent plus qu’eux. Et si quelque chose ne se passe pas bien, c’est clair que c’était la faute à quelqu’un d’autre – la défaite ne sera certainement pas attribuée à leur manque d’application ! Par ailleurs, il y a des Directeurs qui ont cet état d’esprit croissant. Ce sont les gens qui travaillent très dure pour atteindre leurs objectifs. Ils s’entourent d’autres personnes ayant cet état d’esprit croissant, et ils investissent à faire développer ces gens qui les entourent. Les directeurs ayant un état d’esprit croissant sont ceux qui mettent en marche des plans audacieux et visionnaires que ceux qui sont avec des états d’esprit fixe. La peur de faire une erreur ne leur retient pas si bien que celui – ci sera vu directement comme en ligne. Quel type pensez-vous être efficace ? Quel type êtes – vous ? Ou quel type seriez-vous ? Pensez vous que avez un état d’esprit fixe, mais vous avez des raisons de croire que la croissance de l’état d’esprit pourrait vous servir en mieux ? Si c’est le cas, j’ai une bonne nouvelle pour vous ! Vous pouvez faire le défi ! Prof. Dweck, initialement une personne avec un état d’esprit fixe qui avait l’habitude d’éviter des opportunités qui pourraient entraîner un échec, disait qu’elle avait changé – pour le meilleur. En même temps, elle a noté que le changement entraîne un dur labeur et un dévouement. Pourquoi est – ce que je parle d’état d’esprit ? Qu’est ce que cela a à voir avec le Voyage vers l’Excellence – le cadre dans lequel beaucoup d’entre vous me connaissent ? Avant de lire le livre de Prof. Dweck, je savais que beaucoup de points dans le Voyage vers l’Excellence avait beaucoup à voir avec l’état d’esprit. Nous parlons d’aider les gens – individus et des équipes de management – pour développer un « état d’esprit entrepreneurial ». Le séminaire de « Prenez en Charge votre Vie » atteignent spécialement « les gens qui veulent entreprendre leur vie ». Qu’est ce qu’une personne entreprenante ? Je peux comprendre qu’une personne avec un état d’esprit entreprenant est celui qui est proactif, celui qui voit activement les opportunités, et utilisent ainsi ces forces et considérer en tant qu’avantage. Cela marchera mieux, bien sur, si la personne comprend bien ses forces et ses faiblesses – tel que les gens avec un état d’esprit croissant le sont. Une personne entreprenante est une personne orientée objectif, voulant prendre des risques ; il ou elle sera capable de surmonter des revers, les utiliser en tant qu’opportunités pour croître, non pas des menaces pour leur propre image. Je pense que c’est une autre façon pour définir un personne orientée croissance. Je pense que vous êtes ici aujourd’hui parce que vous avez un état d’esprit croissant. Vous avez décidé de donner votre maximum et de vous améliorer. Vous aviez probablement des revers en chemin. Mais maintenant que vous êtes présents ici, vous avez certainement surpassé ces revers. Mon défi pour vous est : continuez à faire votre maximum ! Gardez vos objectifs en tête, voyez les opportunités pour croître et améliorer. La vie est un Voyage, faites – le ! Prof. Dweck’s research indicates that there are 2 types of mindset: the fixed mindset, and the growth mindset. If you believe your characteristics are fixed, if you have a fixed mindset, you feel the need to continually prove yourself, to validate your self-image. Every situation is evaluated in light of how you will feel, how you will look, relative to your fixed perception of yourself. Not everyone can become an Einstein, but with years of “passion, toil and training” many, many things are possible! Do you avoid situations that could put that image at risk? In other words in which you could fail? These are all characteristics of a fixed mindset. Alternatively, do you see life as a journey, with exciting challenges – and opportunities to learn and improve? Do you set very challenging tasks – very high goals – for yourself? Do they require such a stretch that you may, despite making your very best effort, not achieve them? Don’t get me wrong; one can go far in life with a fixed mindset. There is even a “sickness” associated with it: the “CEO disease”. Many of you are, or aspire to becoming, a CEO. What do you think are the symptoms of this malady? People with the CEO disease need to be seen as all-knowing and perfect (so much smarter than all others). They want to be idolized; they don’t tolerate people who know more than they do. And if something goes wrong, it was clearly someone else’s fault – the failure can most certainly not be ascribed to their own lack of application! On the other hand, there are CEOs with a growth mindset. These are people who work very hard to achieve their goals. They surround themselves with other growth mindset people, and they focus on developing them. Growth minded CEOs are more likely to make bold, visionary moves than those with fixed mindsets. Fear of making a mistake does not hold them back as much as it does someone who sees their image on the line. What type do you think is more sustainably successful? What type are you? Or what type will you be? Do you find that you have a fixed mindset, but suspect that a growth mindset would probably serve you better? If so, I have good news for you! You can change! Prof. Dweck, initially a fixed mindset person who used to avoid opportunities if they could entail failure, says that she has changed – for the better. At the same time, she notes that the change entails hard work and dedication. Why do I talk about mindset? What does it have to do with the Journey to Excellence – the framework within which many of you know me? Before I read Prof. Dweck’s book, I knew that much of what the Journey to Excellence was about had to do with mindset. We speak of helping people – individuals and management teams – to develop an “entrepreneurial mindset”. The “Take Charge of Your Life!” workshops specifically target “people wanting to lead an enterprising life”. What’s an enterprising person? Well, I understand a person with an enterprising mindset to be one who is pro-active, who actively looks for opportunities, and then uses their strengths to take advantage of them. And by the way, research shows that people with a growth mindset have a more exact understanding of their own strengths and weaknesses than those with fixed mindsets. Think of the consequences! An enterprising person is goal oriented, willing to take risks; he or she is able to move beyond setbacks, using them as opportunities to grow, not threats to their self-image. In my view, that is another way to define a growth-oriented person. I strongly suspect that you are here today because you have a growth mindset. You have decided to stretch and improve yourself. You probably had some setbacks along the way. But since you are here, you must have overcome them. Cecilia Gaolathe, MD of the Dream Centre, followed her passion for children with disabilities when she founded The Dream Centre in Gaborone, Botswana. 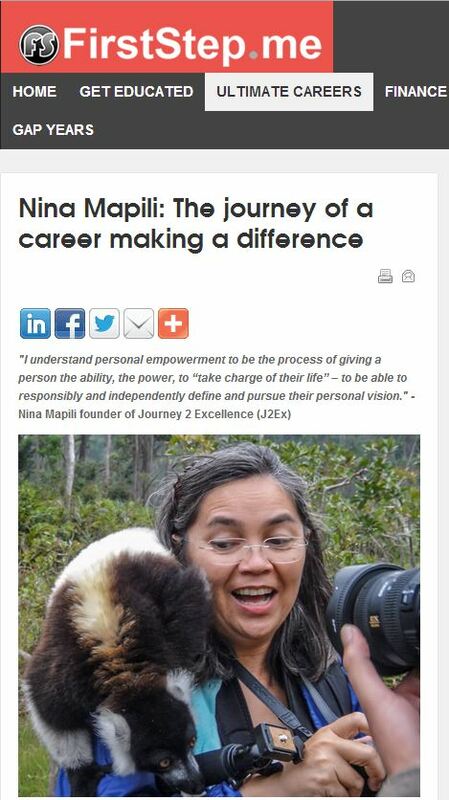 Following a Journey to Excellence (J2Ex) Program “Take Charge of Your Business!” (TCYB) workshop, she began professionalising the way she managed the business – learning to “strike a balance” that enabled her to sustainably follow the passion. 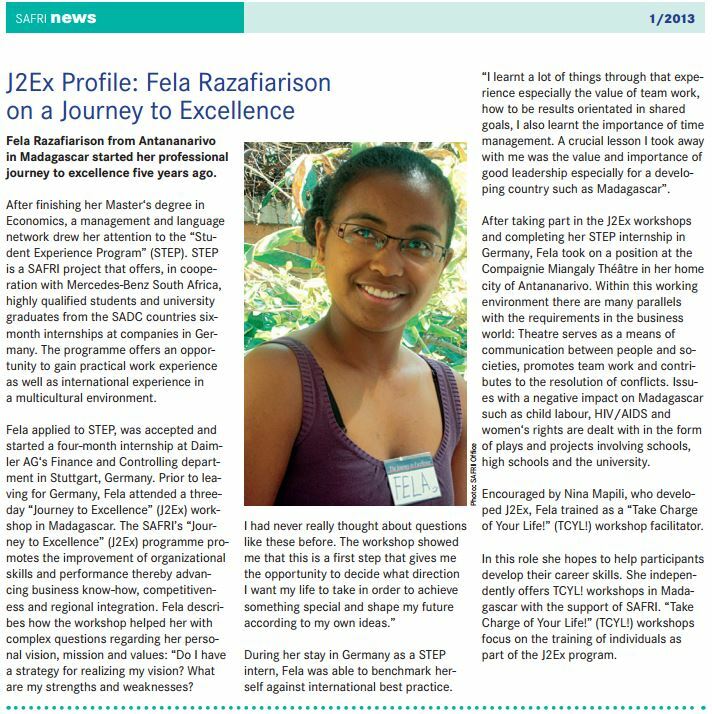 In the J2Ex video, program participants and partners speak of their experiences. 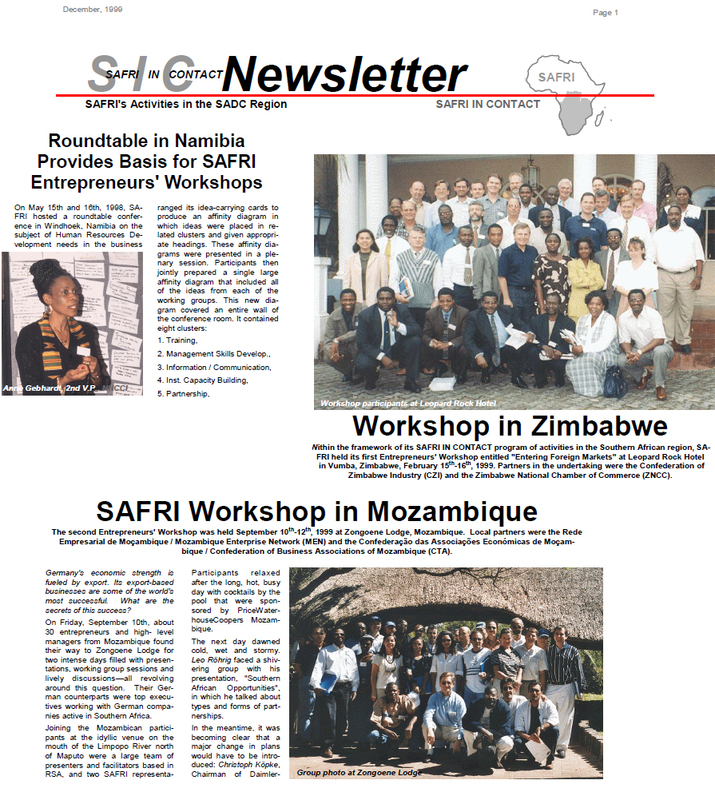 The SAFRI In Contact 1999 Newsletter documents – among other things – the beginnings of Nina Mapili’s work with SAFRI. This is where the J2Ex program has its roots. Check out the whole SIC Newsletter (link above) to read in detail. 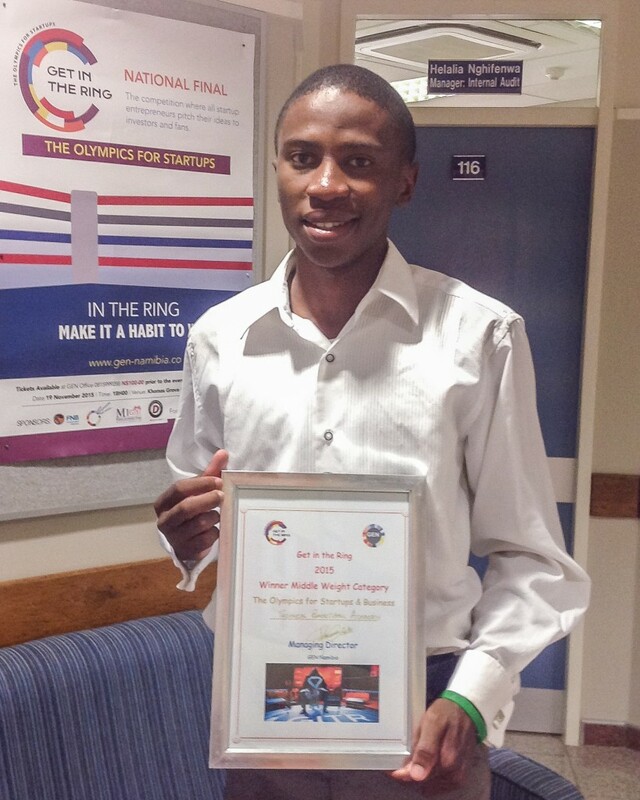 Themba Nkomo, Managing Director of Lloyd Corporate Capital (Pvt) Ltd., talks about his Journey. MD Eddie Kaluwa talks about how Combine cargo Malawi Limited has grown on its Journey to Excellence. La formation Take Charge of Business est de retour ! Reservée aux cadres supérieurs, la formation internationale TCYB se tiendra de noveau du 20 au 22 mars à la Résidence Ankerana. 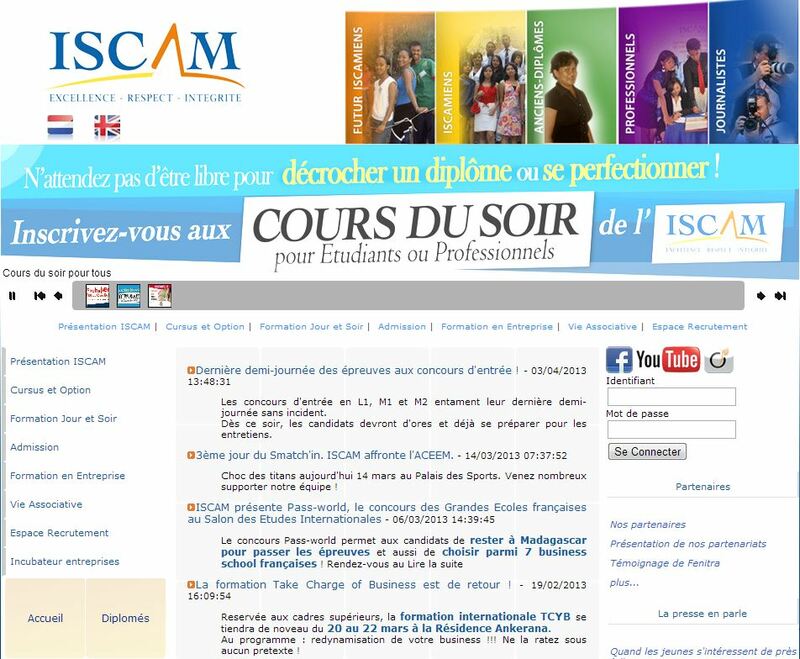 Au programme : redynamisation de votre business !!! Ne la ratez sous aucun pretexte ! 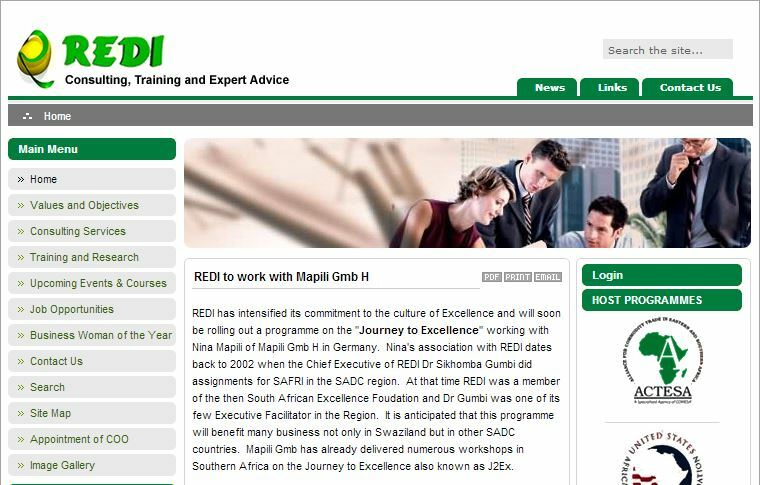 REDI, Mbabane, Swaziland-based the Regional Excellence and Development Initiative, is poised to ramp up its involvement with the J2Ex Program. 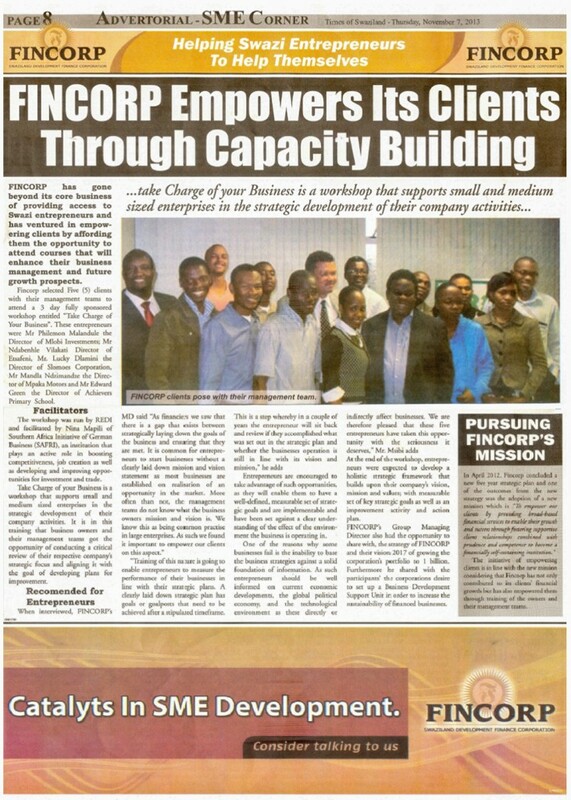 Though my work in Africa began with a focus on organisational and business excellence, and targeted fairly well established businesses – with the goal of helping them become more competitive – over time it expanded with offerings targeting less “sophisticated” businesses and organisations, and the people within them. These days I work mostly in the latter area, specifically offering, and developing new facilitators for, workshops called “Take Charge of Your Business!” (TCYB) and “Take Charge of Your Life!” (TCYL). TCYB helps management teams develop strategic frameworks for their business, and develop action plans to implement them. TCYL does the same for an individual – a task that in many ways is even more challenging than for a business. So what does that mean in this context? It means that people need to take personal responsibility for their lives and their futures, not simply cede this responsibility to governments, chiefs, parents, or any others who might come along. This will strengthen Africa and other developing regions. Of course, this also implies good education for all, not just for a small elite! Any crazy or out the box adventures that you have had with The Journey to Excellence program? My day-to-day would be pretty out of the box for many, what shall I list? – I had the chance to meet a fascinating assortment of people – from farmers in mud huts to presidents in palaces – from Madagascar to Togo (15 African countries), many European countries, some in Asia, the US… Next week I’ll be talking about the J2Ex program in Vietnam! Where do you see the program in 5 years time? I see dozens of independent J2Ex facilitators taking the program to the next level by reaching out to more varied groups of participants. As a result, I see thousands of people, businesses and organisations increasingly and successfully “Taking Charge”! At present, for example, workshops can be presented in English, Ndebele, Shona and French. We have facilitators and partners reaching out to small and medium businesses, entrepreneurs, youth, employees, children. All of this primarily, but not only, in urban areas. That leaves a lot of room for expansion! In terms of young individuals looking to venture into developing countries through various internship programs and NGO setups, what advice do you have for them? Go for it! But remember: keep an open mind, and be ready to challenge your preconceptions. Your average day is not average at all! How do you manage your hectic schedule and do you kick start you day with a cup of coffee? When I’m home, I start the day with a really good cup of tea. When I travel, I try to do the same. If that is not possible, I resort to coffee. Prioritize, systematize, focus, delegate… and work as smart as possible (while also working really hard). Of course it helps that I am highly motivated, since I see that what I do has a positive impact on individual’s lives. If you could name your own planet what would you call it? When I said recently that I was “off to look for lemurs”, one of my friends replied “…that sounds like a new planet”. However the lemurs were really easy to find, so I thought “No, not a good option. A planet should be named after something more elusive.” This got me thinking about animal-related names. Between flights on the way home from Madagascar recently, I visited a botanical garden in South Africa. There I hiked along a special dassie path. The path was long, the day was hot, and no dassies were in sight – beyond a quick shadow seen out the corner of my eye . So, I thought, “is this the name for a new planet? Something suspected but not seen?” As a Trekkie, I take such questions seriously! I’d add Joel Barker’s words: “Vision without action is merely a dream. Action without vision just passes time. Vision with action can change the world.”, and then challenge young people to go out and change the world – for the better. 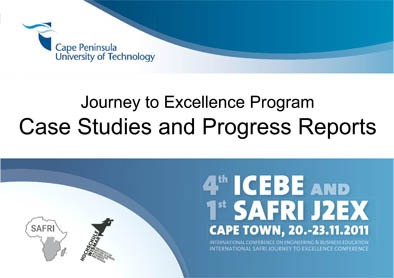 You can find out more about the Journey to Excellence (J2Ex) program on their Facebook!